Use the form below to inquire about Forest Ranch near Soochipara Waterfalls . Use the form below to reserve for Forest Ranch near Soochipara Waterfalls . Air Conditioned Room, Hot and Cold Running Water, Private Balcony/Verandah, TV with cable connection in each rooms. Air Conditioned Room, Hot and Cold Running Water, Private Swimming Pool, TV with cable connection in each rooms. Ceiling Fan, Hot and Cold Running Water, Laundry Service, Private Balcony/Verandah, Tea/Coffee Maker, TV with cable connection in each rooms. Air Conditioned Room, Hot and Cold Running Water, Private Balcony/Verandah, Tea/Coffee Maker, TV with cable connection in each rooms. Air Conditioned Room, Hot and Cold Running Water, Private Balcony/Verandah, Room Service, TV with cable connection in each rooms. This Forest Ranch near Soochipara Waterfalls is on the banks of a stream that flows placidly thru the forests of Wayanad. From the moment you enter this whimsical getaway, everything surpasses your imagination. The wooden fencing, log paved stairway with rope, suspended rope bridge and uniqueness of the architecture of cottages, as if suspended in animation, the beauty of the mist-filled ambiance against tall trees, serenity, and poise of the pebble rich glimmering stream, all come together to create an extravagant jungle retreat. This Forest Ranch near Soochipara Waterfalls is the kind of abode that you don’t come across every day and wish to never leave. 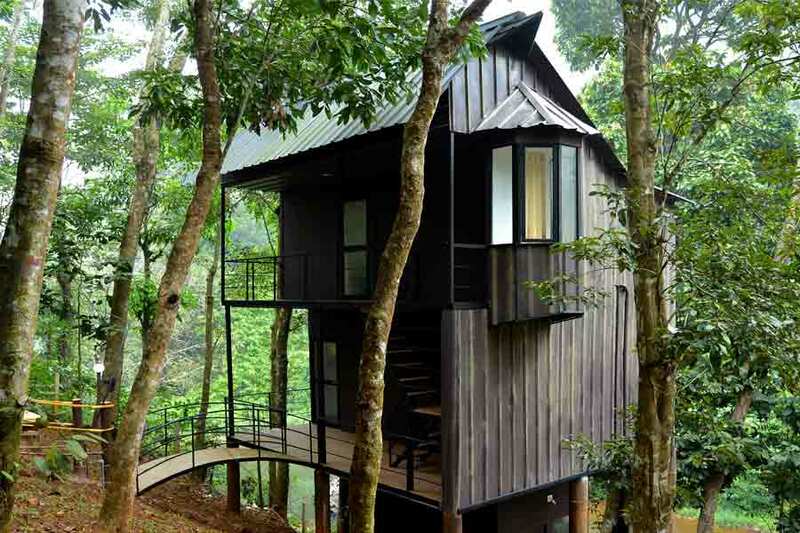 The cottages at this Forest Resort have unique geometrical patterns for the exteriors and the elevated log hut construction provides the most spectacular tree house experience. All cottages have a deck for a personal rendezvous with jungle tranquility. Even on the elevated walkways, you will be compelled to pause and lose yourself in the bliss. A few cottages have skylights to view the mystical jungle sky right from your cozy lodgings. Romantic Hut, Sultan’s Retreat, Phantom Villa, and Gypsy Inn are the most popular cottages. The interiors are contemporary and crisp. Pastel and soft tones of furnishings are soothing and luxurious. Each room comes equipped with all modern amenities. Claddings against glass walls add a rustic twist to the entire decor. ‘Discover Nature’ and ‘Ranch Special’ are packages offering sightseeing along with food and accommodation. The Honeymoon package offers all that and extra indulgences such as flower decorations and candlelight dinner for wonderful memories at the Resort. Savor the carefully prepared vegetarian delicacies as you relish the jungle mystique flooding from the restaurant’s massive glass windows. An Ayurvedic spa, gym, conference room, game room, and kids’ play area leaves the guests spoilt for choice with activities to engage in. The natural stream flowing by is a major eye candy inviting guests to drench their feet and take long walks along its pebbled banks. Barbecue and campfire add euphoria to your magical evenings here. All activities as per plan/package chosen. All activities that are not mentioned in inclusions. Foreign tourists will also need to have proof of identity as per regulations. All foreign nationals will have to provide copies of their passport and visa on arrival. Check-in at 12:00 pm and check-out at 11:00 am. Peak season hike @ Rs. 1000 extra per room from 21st December 2016 to 01st January 2017. Cancellation of GIT Bookings: If cancellation is made between 5-10 days, 50% of the amount is forfeited and with less than 5 days remaining, the client loses the entire amount for GIT. Cancellation of FIT Bookings: If cancellation is made between 5-10 days, 25% of the amount is forfeited and with less than 5 days remaining, the client is liable to pay a one-night charge as retention. All the special room rates are offered on a double sharing basis. Above rate is applicable for all FIT bookings. All FIT and GIT bookings must be confirmed within 15 days. An advance payment should be made at the time of confirmation of the reservation for both FIT and GIT. Full and final payment to be made 7 bank working days before the date of the tour for FIT bookings. Go on a guided trek of the property and beyond blazing a trail along the dense tree shades and experience the pristine air. A stroll along the beautiful natural stream is a rejuvenating experience to the mind and body alike. Unleash the shutterbug in you with some surreal nature photography. Set out on a bird watching spree as these terrains of the Western Ghats are home to more than 350 species of birds. Most of the local sightseeing spots in Wayanad are in close proximity to the Forest Resort. The resort also conducts sightseeing trips to Elimbileri Forests as well as guided tours to popular tourist destinations on demand. Take a jeep safari through the Muthanga or Tholpetti Wildlife Sanctuaries and experience its majestic inmates in their natural habitat. At the Edakkal Caves, watch the new Stone Age pictographic indicative of the existence of civilizations here in prehistoric times. Soochippara Waterfalls allows a spectacular vantage point for bird watching and adventure water sports in the pool below. Meenmutty waterfall is a fierce show of nature’s might and not to be missed. Uninhabited Kuruva Islands are a haven for exploring the rainforest and a popular picnic spot. Enjoy a mesmerizing boat ride through the tranquil Pookotte Lake or along the spectacular reservoir of Banasura Dam. Abmalavayal Heritage Museum, Thusharagiri waterfalls, Thirunelli temple, and Paapanashini river are other attractions. If your heart yearns for more adventure, venture on trekking expeditions to Pakshipadalam or Chembra Peak to witness spectacular panoramic views of Wayanad and the mountain ranges of the Western Ghats. Campfire and barbeque dinner after a long day of sightseeing is the perfect recipe for unwinding before you cozy up in your hideout. Bangalore is 322 km (appx 6 hrs), Mysore is 170 km (appx 3 hrs), and Calicut is the nearest airport at 85 km (appx 1.5 hrs). The surroundings of this Forest Resort are reminiscent of the stunning landscape featured in the blockbuster movie ‘Avatar’. Nestled in a lush location, just a short distance from the small township of Meppadi, this resort captures the true essence of living in the forest with a stream running below where you can enjoy a picnic as you dip your feet in the cool water. A perfect getaway for nature lovers, far away from the hustle bustle of city life; serenity, solitude and communing with nature come easily here. The cottages named Phantom Villa, Romantic Hut, and Gypsy Inn Cottage are on stilts and are tastefully and appropriately furnished. Each cottage has a unique ambience and décor. A spa, hanging bridge, restaurant, and a small play area for children are some useful facilities offered here. Just the perfect place to unwind, let go off all stress and discover yourself in the peace and quiet of this beautiful resort.